If there was ever a strange choose-your-own-adventure that’ll totally mess with your head – and for all the right reasons – then I’d say this is more than likely it. Purists may not be overly fond of this nonsensical take on Shakespeare’s masterpiece, but I’m willing to bet that everyone else will find plenty reasons to like the silliness of To Be or Not To Be. You’ll be playing the part of either Hamlet, Ophelia, or king Hamlet (Hamlet’s dad), as your character of choice embarks on a grand adventure, full of… choices. Choices and consequences. Because, choose-your-own-adventure, ya know? Seriously though, far as I can tell, this one’s as much a learning experience as it is an entertaining one. After all, Tin Man Games, creator of this digitized version, claims that the origin of “Till death us do part”, the meaning of the word “pernicious”, and several other things will be explained. Neat… I think? William Shakespeare’s Hamlet has finally been restored to its original second-person non-linear branching narrative format. Now it’s up to YOU to decide what happens next. 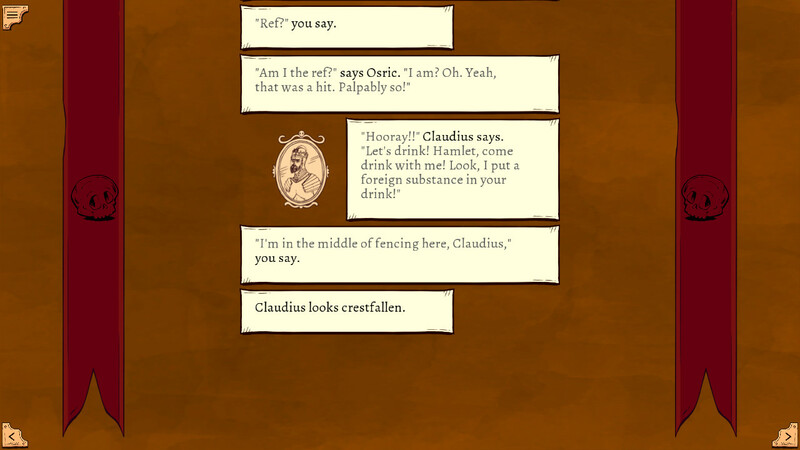 Unlike most other games of this sort, To Be or Not To Be lets you truly create your own story with each choice, featuring plenty of branching paths. Or you could take the boring route and simply follow the original story, as indicated by markings from Tiny Yorick himself. Why anyone would do that is beyond me though, because it seems like the whole point of this adaptation is to let players to go completely nuts; rewrite Hamlet as it were, step by step, one humorous disaster after another. And really, what better way to experience the classic, than as you see fit? Ryan North’s To Be or Not To Be is available from Steam/Humble (Windows, Mac, Linux – $12), iTunes (iPhone, iPad – $6), Google Play (Android – $5.99).